A frequent need when composing UIs is to bind a property to an information source to separate presentation and content (and logic). There are several ways to accomplish this task including MVC, MVVM and MVP. A core concept to realize those architectural concepts in Windows Forms (and WPF) is property binding. The .NET Framework System.Windows.Forms.RichTextBox provides an Rtf property that gets or sets the text of the RichTextBox control, including all rich text format (RTF) codes. 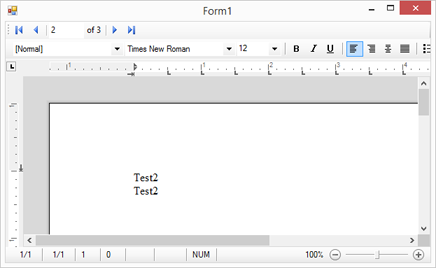 This property accepts formatted text in the RTF format and can be used to bind the RichTextBox directly to data sources. As TX Text Control supports many different file formats including DOC, DOCX, RTF and PDF, the file loading concept differs from the RichTextBox and is implemented using a central Load method to import various input streams.